Epilepsy is a chronic noncommunicable disease of the brain that affects more than 50 million people worldwide. It is characterized by recurrent seizures, which are brief episodes of involuntary movement that may involve a part of the body (partial) or the entire body (generalized) and are sometimes accompanied by loss of consciousness and control of bowel or bladder function. Seizure episodes are a result of excessive electrical discharges in a group of brain cells. Different parts of the brain can be the site of such discharges. Seizures can vary from the briefest lapses of attention or muscle jerks to severe and prolonged convulsions. Seizures can also vary in frequency, from less than 1 per year to several per day. One seizure does not signify epilepsy (up to 10% of people worldwide have one seizure during their lifetime). Epilepsy is defined as having two or more unprovoked seizures. Epilepsy is one of the world’s oldest recognized conditions, with written records dating back to 4000 BC. Fear, misunderstanding, discrimination and social stigma have surrounded epilepsy for centuries. This stigma continues in many countries today and can impact on the quality of life for people with the disease and their families. Characteristics of seizures vary and depend on where in the brain the disturbance first starts, and how far it spreads. Temporary symptoms occur, such as loss of awareness or consciousness, and disturbances of movement, sensation (including vision, hearing and taste), mood, or other cognitive functions. People with seizures tend to have more physical problems (such as fractures and bruising from injuries related to seizures), as well as higher rates of psychological conditions, including anxiety and depression. Similarly, the risk of premature death in people with epilepsy is up to three times higher than in the general population, with the highest rates of premature mortality found in low- and middle-income countries and in rural versus urban areas. A great proportion of the causes of death related to epilepsy especially in low- and middle-income countries are potentially preventable, such as falls, drowning, burns and prolonged seizures. Epilepsy accounts for a significant proportion of the world’s disease burden, affecting more than 50 million people worldwide. The estimated proportion of the general population with active epilepsy (i.e. continuing seizures or with the need for treatment) at a given time is between 4 and 10 per 1000 people. However, some studies in low- and middle-income countries suggest that the proportion is higher, between 7 and 15 per 1000 people. Globally, an estimated 2.4 million people are diagnosed with epilepsy each year. In high-income countries, annual new cases are between 30 and 50 per 100 000 people in the general population. In low- and middle-income countries, this figure can be up to two times higher. This is likely due to the increased risk of endemic conditions such as malaria or neurocysticercosis; the higher incidence of road traffic injuries; birth-related injuries; and variations in medical infrastructure, availability of preventative health programmes and accessible care. Close to 80% of people with epilepsy live in low- and middle-income countries. 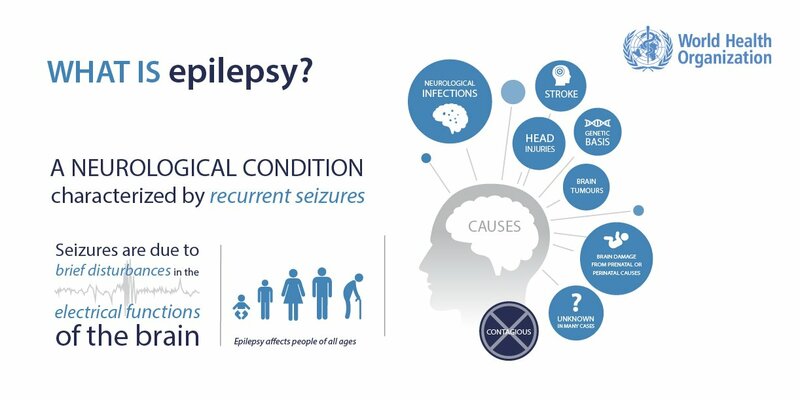 Epilepsy is a chronic noncommunicable disease of the brain that affects people of all ages. More than 50 million people worldwide have epilepsy, making it one of the most common neurological diseases globally. Nearly 80% of people with epilepsy live in low- and middle-income countries. It is estimated that 70% of people living with epilepsy could live seizure- free if properly diagnosed and treated. About three quarters of people with epilepsy living in low- and middle- income countries do not get the treatment they need. In many parts of the world, people with epilepsy and their families suffer from stigma and discrimination. Epilepsy is not contagious. The most common type of epilepsy, which affects 6 out of 10 people with the disease, is called idiopathic epilepsy and has no identifiable cause. Seizures can be controlled. Up to 70% of people living with epilepsy could become seizure free with appropriate use of anti-seizure medicines. Low-cost treatment is available, with daily medication that costs as little as US$ 5 per year. Furthermore, after 2-5 years of successful treatment and being seizure-free, drugs can be withdrawn in about 70% of children and 60% of adults without subsequent relapse. In low- and middle-income countries, about three quarters of people with epilepsy may not receive the treatment they need. This is called the “treatment gap”. In many low- and middle-income countries, there is low availability of anti-seizure medication. A recent study found the average availability of generic anti-seizure medicines in the public sector of low- and middle-income countries to be less than 50%. This may act as a barrier to accessing treatment. It is possible to diagnose and treat most people with epilepsy at the primary health-care level without the use of sophisticated equipment. WHO pilot projects have indicated that training primary health-care providers to diagnose and treat epilepsy can effectively reduce the epilepsy treatment gap. However, the lack of trained health-care providers can act as a barrier to treatment for people with epilepsy. Surgical therapy might be beneficial to patients who respond poorly to drug treatments. Idiopathic epilepsy is not preventable. However, preventive measures can be applied to the known causes of secondary epilepsy. Preventing head injury is the most effective way to prevent post-traumatic epilepsy. Adequate perinatal care can reduce new cases of epilepsy caused by birth injury. The use of drugs and other methods to lower the body temperature of a feverish child can reduce the chance of febrile seizures. Central nervous system infections are common causes of epilepsy in tropical areas, where many low- and middle-income countries are concentrated. Elimination of parasites in these environments and education on how to avoid infections can be effective ways to reduce epilepsy worldwide, for example those cases due to neurocysticercosis. Epilepsy accounts for 0.6% of the global burden of disease, a time-based measure that combines years of life lost due to premature mortality and time lived in less than full health. Epilepsy has significant economic implications in terms of health care needs, premature death and lost work productivity. The economic impact of epilepsy varies significantly depending on the duration and severity of the condition, response to treatment, and the health care setting. Out-of-pocket costs and productivity losses create substantial burdens on households. An economic study from India estimated that public financing for both first- and second-line therapy and other medical costs alleviates the financial burden from epilepsy and is cost-effective (1). Although the social effects vary from country to country, the stigma and discrimination that surround epilepsy worldwide are often more difficult to overcome than the seizures themselves. People living with epilepsy can be targets of prejudice. The stigma of the disease can discourage people from seeking treatment for symptoms, so as to avoid becoming identified with the disease. In the United Kingdom, laws which permitted the annulment of a marriage on the grounds of epilepsy were not amended until 1971. In the United States of America, until the 1970s, it was legal to deny people with seizures access to restaurants, theatres, recreational centres and other public buildings. Legislation based on internationally accepted human rights standards can prevent discrimination and rights violations, improve access to health-care services, and raise the quality of life for people with epilepsy.